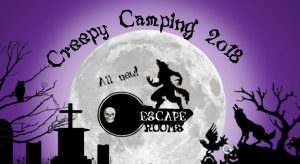 It’s time for our annual Creepy Camping! We will kick off Creepy Camping with an outdoor showing of “Hotel Transylvania” at dusk (around 7:30 p.m.) on Friday evening. Genoa Bluffs Farms will be offering Ghost Town kettle corn and drinks for sale. We are excited to bring back some favorite activities and try out some new activities. This year we are replacing the haunted hayride with 2 Escape Rooms. There will be a room designed for groups of 2-6 people that are 10 years and older. You will discover that someone in your group has been bitten by a werewolf and you have 30 minutes to find the antidote. There will be a series of problems to solve using clues hidden in the main level and children’s area of the Nature Center. Each group must pay $10 at the Nature Center before entering the Escape Room. The second room is intended for groups of 2-6 that are 9 years old and under. All groups must be chaperoned by an adult. When you enter the lower level of the Nature Center you discover that a thief has been ransacking campsites at Lake Iowa. You have 15 minutes to find the culprit before your campsite is hit. There will be an easier set of problems to solve using hidden clues in the room and a volunteer will be in the room to provide hints. Each group must pay $5 before entering the Escape Room. There are 12 timeslots available for the older Escape Room and 21 timeslots for the younger Escape Room. Click on the sign up link below to go to our Sign Up Genius page and select the age group you plan to attend. Please limit your sign up to one time slot and only select one slot for one group of 2-6 people. Also new this year is the 4-H Pumpkin Rolling fundraiser sponsored by the Four Leaf Clovers from Williamsburg. Each pumpkin will cost $5 and each participant will try to roll their pumpkin through a Charlie Brown themed obstacle course set up by the Round House in the Lake Iowa Campground. This event begins at 10:00 a.m. Registration for our Creepy Camping Dummy Board Tournament begins at 12:30 p.m. on Saturday behind the Nature Center on the lower level. The double elimination tournament will begin at 1:00 p.m.
We will hold a costume contest at 4:00 p.m. on Saturday on the lawn in front of the Nature Center. Members of our staff and Friends of Iowa County Conservation Foundation will hand out ribbons for most creative, scariest, best group, funniest and best overall costume. We will also be visiting campsites during the weekend to determine which sites will be awarded “Best Daytime Halloween Decorating” and Best Evening Halloween Decorating”. At 5:00 p.m. on Saturday we will close off the campground road so that trick-or-treaters can visit campsites from 5:00 p.m. to 7:00 p.m.
Sundown Lounge will be selling Halloween pizzas at the Nature Center parking area at the campground host site beginning around noon on Saturday. We hope everyone enjoys a fun-filled Creepy Camping! 2019 Iowa County Conservation Now Open Summer Camp Registration Now Open! Striving to provide a better Iowa County through conservation, education, and recreation.